As drawers open and close, fragile items can get damaged. 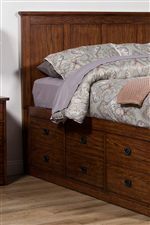 Felt-lined drawers keep items protected with its soft lining and textured surface to help stop excess movement. Keep silver and other precious items safe in the confines of a felt-lined drawer. Add this sideboard to your dining room for classic mission style and convenient storage space. The sideboard features open and concealed storage, with one open base shelf and doors and drawers to keep items neatly tucked away. Crafted from oak veneer and solid hardwood and finished in a warm Medium oak color, the sideboard exudes classic mission style. The Colorado 54" Sideboard with Felt-Lined Drawers by Winners Only at Godby Home Furnishings in the Noblesville, Carmel, Avon, Indianapolis, Indiana area. Product availability may vary. Contact us for the most current availability on this product. 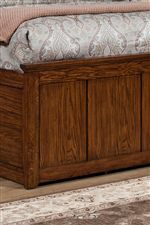 The Colorado collection is a great option if you are looking for Mission furniture in the Noblesville, Carmel, Avon, Indianapolis, Indiana area. Browse other items in the Colorado collection from Godby Home Furnishings in the Noblesville, Carmel, Avon, Indianapolis, Indiana area.